Welcome to Indycube Porthmadog, placed in a prime location near the sea. The office is half a mile away from both the train and bus stations, which is about a ten minute walk, so it's ideal those who need to commute. Of course, there is ample room and plenty of FREE Tea and coffee as well as Wifi. 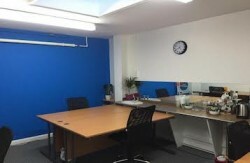 Indycube Porthmadog is open from 9 am – 5:00 pm Monday to Friday.